I love following trends, I love hearing about what's new best and what everyone is going to be wearing. But I don't know if I'm one to necessarily follow them when it comes to my own personal style. I like to pick good, solid pieces that I know are going to last me for seasons, maybe years. I'm very influenced by old Hollywood movies such as Roman Holiday or Funny Face. Sometimes when I'm shopping, I'll (not so secretly) ask myself, would Audrey wear this? Sometimes I'll mix in current trends (*ahem*, hi there platform sandals) with classic looks but with a limited budget it's important that I don't blow my personal clothing allowance on pieces that are going to be cycled through too quickly. That, and I love a solid, classic style and feeling like I could have just popped out of an Audrey Hepburn movie. This cropped mock turtleneck is not only on trend, but it's also a classic and I love the little flair that these ankle-length pants have. I would usually go with something a little more tapered at the leg but I wanted to try something different. Also, these platform sandals are surprisingly comfortable. I bought this hat when I was living in London for less than 10 pounds at Urban Outfitters on High Street and it's been on constant rotation, I've worn it HERE and HERE on the blog. It's going to be a struggle to not buy all burgundy this season, it's always been my color weakness every fall! you can never go wrong with a classic outfit. I also I'm the same way when buying clothes. I absolutely love mixing classic pieces with current trends, too! The burgundy looks wonderful on you, and I love the mock turtleneck! Your sandal platforms are gorgeous; I need a pair! Would Audrey wear this? You know asking that is a great shopping strategy, especially when we want to shop elegant and timeless pieces. You look very pretty and sweet. This outfit is so stylish....great turtleneck and pants combo...and I love your hat!!!!! I love that your style is influenced by old Hollywood movies. You look lovely here, so in love with your shoes! You. Look. Amazing! That sweater is so stunning. Love the colour on you! You look very trendy with your platforms and cropped turtleneck. I agree, I try to pick the ones that work best for me. So cute! What a perfect fall look! 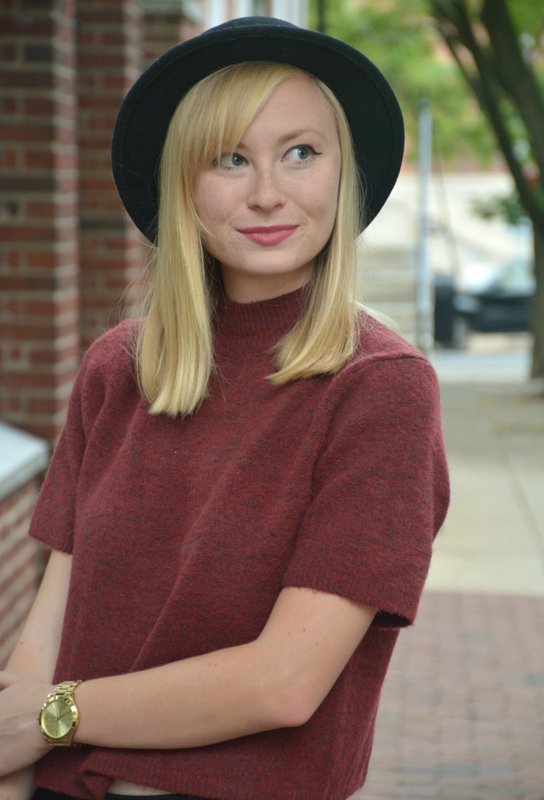 I love hats like this in the fall! Happy Friday! The color of that shirt is so pretty! And I wish I could rock hats like that!!! Hey Chelsea! Love your outfit and style! I also agree that there are some classic trends out there and there are definitely pieces that I still love to pull out of the closet later in time. Wow this outfit is absolutely incredible! !